Ms. Forkner graduated with honors from The Johns Hopkins University (double major in English and History of Art, 2006) and from Boston University School of Law (2009), where she served as a director for the J. Newton Esdaile Moot Court Program. During college Ms. Forkner studied at St. Catherine’s College, Oxford University (2004). Before joining Lee & Rivers LLP in 2011, Ms. Forkner gained experience in family law and estate planning at a mid-sized Massachusetts firm. Ms. Forkner has been recognized as a Massachusetts “Rising Star” (2013 – 2018). 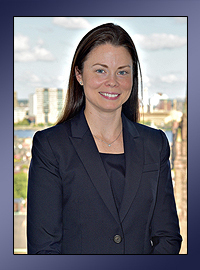 Ms. Forkner is a member of the Family Law section of the Boston Bar Association (BBA) and recently served as the co-chair of the continuing legal education sub-committee. She has co-chaired and moderated several BBA programs on topics including Family Law Appeals, Alimony and Child Support, and Business Valuations in the Family Law Context. Ms. Forkner is also a member of the Women’s Bar Association and was formerly on their Board of Directors (2010-2011). Ms. Forkner currently sits on the Board of Directors of the John Winthrop School for Young Children and is a member of their Executive and Fundraising Committees. She is also a member of the Friends Council of the Esplanade Association. Ms. Forkner has guest lectured at Boston University School of Law on the subject of Separation and Antenuptial Agreements. She also frequently serves as a volunteer judge for the Boston University School of Law moot court programs and as an “Attorney for the Day” in the Norfolk Probate & Family Court. Ms. Forkner is also involved as a mentor in the Women’s Bar Foundation’s Family Law Project. She has co-authored a chapter with Mr. David H. Lee entitled Tax Considerations for the Massachusetts Divorce Law Practice Manuel (2018) with respect to the Tax Cuts and Jobs Act and its impact on family law. Ms. Forkner is admitted to practice in Massachusetts and Maryland.